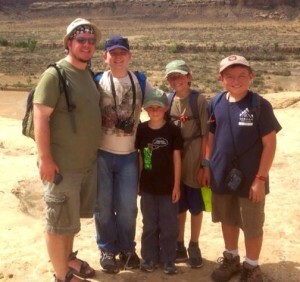 Vincent Thomé , EBTS member lives in Albuquerque, NM with his wife, Kristen, and their 3 children. He is a publisher, graphic designer and web developer, photographer and avid outdoors person: skiing, hiking, camping, etc. The Thomé Family was recently selected for “The Families Project”, an advertising campaign by Betty Crocker that spotlights diverse families in the US today. Kristen and Vincent both brought 12-year-olds from previous marriages to their new family and adopted one more. It’s not always simple, but their family is stronger than they ever could have imagined. Vincent’s family shows us that love is what it takes to make a home. Before this, Vincent showed us what it took to be a survivor. Vincent’s life has not always been as it is now. Vincent was diagnosed with an epidermoid tumor on his brain stem in 1991, during his first year of college. He had surgery that fall in Albuquerque, NM, but was told in December after a follow-up MRI that it was not entirely removed. The tumor appeared to subside in size each year, and in 2001, he was told it would not reoccur. In March 2002, an episode of chemical meningitis from the rupture of the epidermoid tumor into his spinal fluid happened without warning. Experiencing full body paralysis, loss of speech and cognitive function, he spent 5 days quarantined in the hospital. His doctors, unaware of why the symptoms were presenting, and that his condition was not contagious, released him from quarantine. With the symptom of insomnia for almost a year, Vincent was treated for Post Traumatic Syndrome Disorder. This diagnosis was a ‘catch all’ for his problems but his real problem was the epidermoid brain tumor. As a result of his epidermoid tumor’s location on the brain stem, cranial nerve damage had affected the right side of his face, mouth, gums, teeth and tongue. Fortunately this is sensory and not permanent paralysis. The tumor also affected his optical nerves with some double vision along with blurriness in the right eye when looking left of center. Otherwise his vision is 20/20 straight ahead. Later trigeminal neuralgia and facial paralysis presented in 2005. MRI indicated that the epidermoid had grown to 1991 size, and had developed “fingers” that were pervading other areas of my brain. In 2005, Vincent joined an international brain tumor internet organization and became aware of neurosurgeon Dr. Takanori Fukushima as he read other members accounts of surgery by him. Dr. Fukushima was renown with a reputation for the total removal if possible and was successful in doing so. Not many other surgeons can claim this feat, given the often risky skull base location of tumors, the high incidence of complications and recurrence for this type of tumor. Being fully informed of the risks associated with this skull base neurosurgery, and realizing partial facial paralysis may be the outcome, Vincent made the decision to have the epidermoid removed. He was suffering greatly from the tumor and unable to work or care for his son, then age 5. Agreeing to the risks was paramount. Vincent’s 2nd surgery, 14 years later, was performed at Duke Raleigh Medical Hospital in Raleigh, NC in October, 2005. Today, Vincent is raising his family, getting on with life, and filling his home with love.